Welcome to the Artistic Outpost Design Team September Blog Hop! Each month, the fabulous designers at Artistic Outpost showcase projects created with various Artistic Outpost stamp sets/themes, this month the DT Blog Hop theme is Fall. I love the fall weather, a few of our trees are already starting to turn colors at the very top. 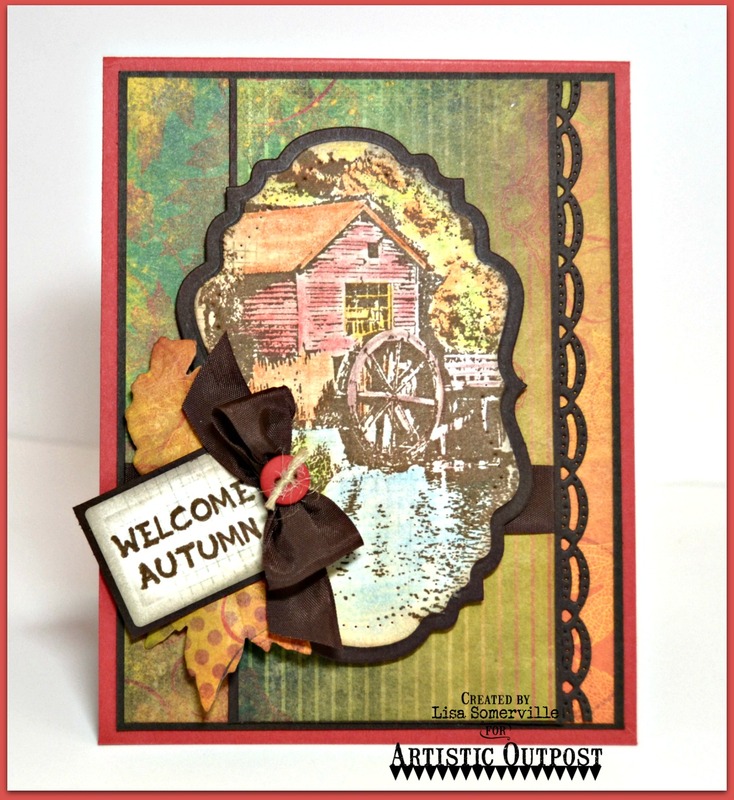 Inspired by the theme this month, I used the Artistic Outpost Old Grist Mill and Hayride stamp sets to create my card. I stamped the image from Old Grist Mill in Ranger Coffee Archival Ink on a scrap of Bo Bunny pattern, coloring the image with STAEDTLER Karat Aquarell Watercolor Pencils, then die cut the stamped panel using one of label dies from the ODBD Custom Vintage Flourish Pattern Die set, layering the panel on an Espresso panel that was die cut using the ODBD Custom Vintage Labels Dies. To embellish my card, I added a stamped tag using a sentiment from the Hayride stamp set, stamping on a scrap of pattern paper, die cutting the panel using the smallest tag from the ODBD Custom Recipe Card and Tags Die set. To further embellish I added Vintage Brown Seam Binding, a button tied with twine, leaves die cut from pattern paper using the ODBD Custom Fall Leaves and Acorn Dies and a border cut from Espresso card stock using the ODBD Custom Beautiful Borders Dies. Such a pretty card! I really like the colors of the mill with the reflective water. I like the decorative edge along with the leaves under your bow. Beautiful card! Lisa, you always have so many lovely layers! Love how you used the Vintage Label die to frame the Old Grist Mill which is beautifully colored and finished off so nicely with the sentiment! Love this! So pretty! The variety of colors looks perfect with the stamping. Loving the bow on the side. Absolutely lovely, Lisa. Gorgeous colors and wonderful textures and patterns. I especially like the brown matting and the fancy border - really adds to the piece! Beautiful card, Lisa!! I love all of the colors that you've used in your inks, and papers and the water coloring of the grist mill image is lovely! Great card for AO! XOXO-Shari T.
Love your layers and colors. Great Fall card.